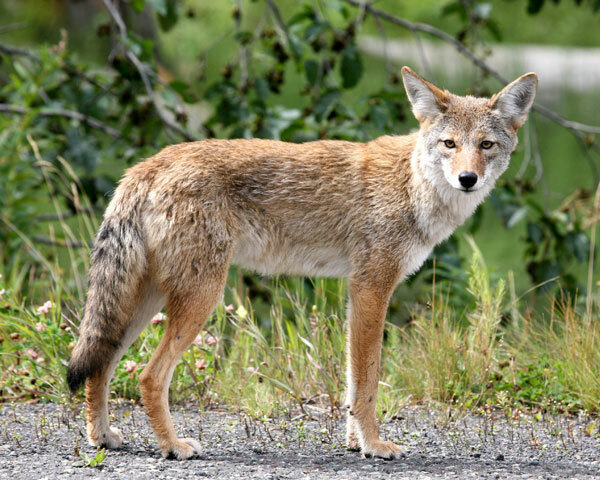 Cocoa Beach / Palm Bay / Satellite Beach: Petitions! Online And In Person. The Cocoa Beach group gathering signatures for a ballot initiative on building heights in the City has to take the day off today because of other things in their lives. They are reporting good results in finding people to sign the petition, but obviously they need more people to help. If you are concerned about this issue and want to help, drop us a line and we’ll forward it to the right people who will then contact you. Even if you can help them collect signatures or talk to people for an hour would be a huge help. The folks in Palm Bay will be back at the (called the South Mainland Service Complex) at 450 Cogan Drive SE, today from 7:30 AM to 11:30 AM. They too are facing a monumental task and if you want to help, you can contact them or drop us a line and we’ll forward that to them for you. There is a new group in the petition drive arena as well. A group called “Satellite Beach Sustainable Outreach” has an online petition for a moratorium on certain types of development until the issues with water / sewage infrastructure in the area have been addressed. Apr 16, 2018 Posted by AAfterwit on Apr 16, 2018 | Comments Off on Electioneering In Satellite Beach. The above notice was mailed out to the residents of Satellite Beach. Our first thought was “who is paying for this mailing?” but it could be the City or the County using franking privileges for commissioners. Smith is in a fight for his Commission seat with Trudi Infantini in the upcoming November elections. As far as we know, Smith has never done anything like this (a mailing and a meeting) so please excuse us if we see this as nothing but a political campaign stop organized with the help of the City of Satellite Beach. 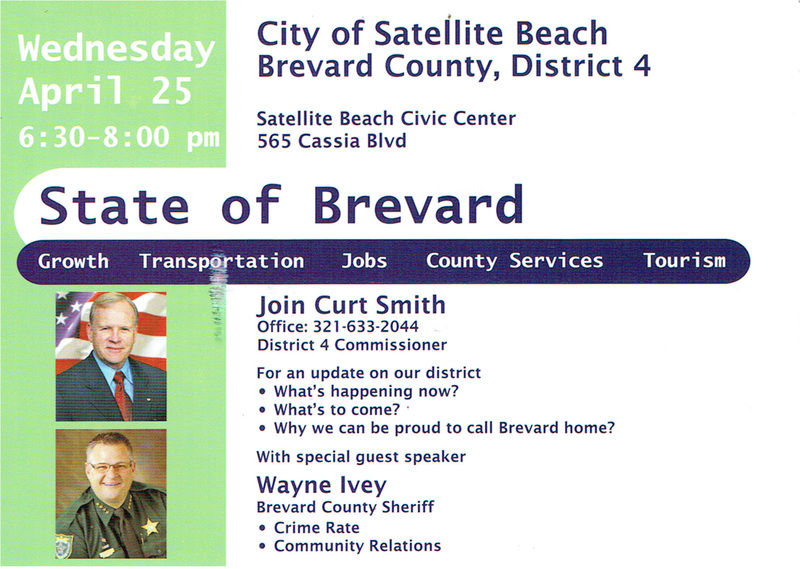 If Smith wants to talk about Brevard County and his “leadership,” we are all for it. First, we want to ask him about his disastrous and unConstitutional “Civility Ordinance” that he proposed and then pulled from the agenda after feedback from many groups and people. Let’s talk about the $5 million for “sports turf” for the Viera Sports Complex. It is not that we are against the expenditure, but rather we are against the idea that the Commission was able to pay for the turf without going through any competitive bidding process by allowing USSSA to pay for the turf, and then the County reimbursing USSSA. The no bid contract may technically be legal, but in a county that is screaming for money to pay for the lagoon and roads, why not have the expenditure above board and within the spirit of the law? Does Smith really think that the County should be doling out $5 million without insuring the taxpayers are getting a good deal? Sep 5, 2017 Posted by AAfterwit on Sep 5, 2017 | Comments Off on Cocoa Beach, Palm Bay, Satellite Beach: If You Like Meetings, You Have Your Choice Tonight. Cocoa Beach, Palm Bay, Satellite Beach: If You Like Meetings, You Have Your Choice Tonight. 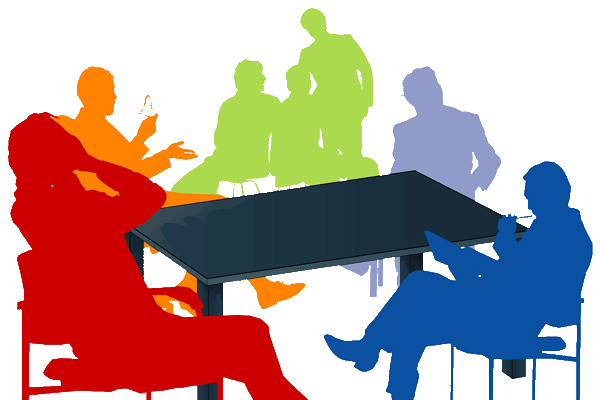 Like a seemingly endless items at a buffet, tonight there are lots of meetings that people can and should attend in their local communities. COCOA BEACH: Tonight Cocoa Beach hosts a Charter Review Board meeting. The agenda for the meeting can be found here. There are some interesting things within the proposed changes to the Charter as we suggest that people read them as they will affect everyone. The City also has two more meetings this week. Tomorrow night there is a Special City Commission Meeting concerning the budget which starts at 6:00 P.M. The Commissioners will be right back at it on Thursday night at 6:00 PM again for a CRA meeting followed by a regular Commission meeting at 7:00 PM. PALM BAY: The City Council will meet tonight at 6:30 PM for a budget meeting as well. Ordinances will be read, discussed and voted upon concerning fees and millage increases. The Council takes a day off and then hosts a regular meeting on Thursday at 7:00 PM. SATELLITE BEACH: Satellite Beach has a Board of Adjustment meeting tonight concerning a variance request made by the developers / architects of the proposed Solar Hotel. We wrote about this variance request and why it does not meet any legal standard for a variance yesterday. Satellite Beach: Solar Hotels And Building Variances. UPDATED WITH ADDENDUM! EDITOR’S NOTE: We have added an addendum to this post below. SATELLITE BEACH — A development group is looking to build what is believed to be the state’s first solar-powered hotel in Satellite Beach. 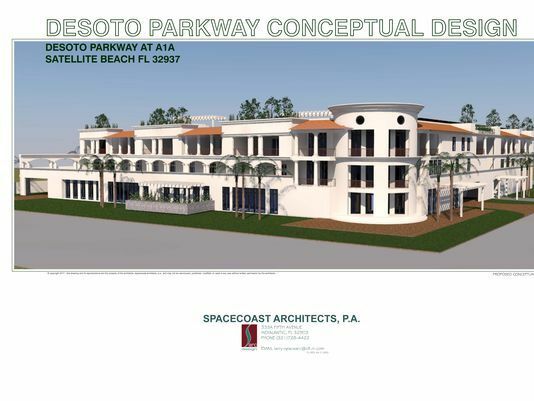 The project, which received approval Monday from the Satellite Beach Advisory Board, is on 1.2 acres on the southwest corner of State Road A1A and Desoto Parkway. That was the former site of a once-popular beachside eatery called Peg Leg’s. The building’s architect, who specializes in environmentally sustainable projects, said the three-story project would use 80 percent less energy than a conventional structure of its type. The property is owned by the city’s Community Development Authority, and officials were particular about what type of development they wanted to see there. Most notably, the wanted a project that fit in with the city’s environmental sustainability efforts. What is not said in the article is that while the City wants structures consistent with its “environmental sustainability efforts,” the City is taking a fiscal bath on this deal. Originally, the City purchased the property for $1.525 million dollars in 2006 and is now selling the property for $860K, a loss of $665K. After the project was approved, the architects of the project, Spacecoast Architects, PA, submitted an application for a variance on the property. A Board of Adjustment meeting will be held on Tuesday, September 5, 2017 at 7:00 PM to hear the variance request. The agenda for the meeting can be found here. The application packet can be found here. We want to look at what is being asked for. The image below is page 6 from the application. We have colored in red and yellow the two properties that are adjacent to the hotel. The red property is not a part of the variance. The yellow property is the issue. Satellite Beach – City Council Meeting Tonight. Tonight at 7:00 PM the Satellite Beach City Council will hold a regular meeting. There are, as always, a couple of interesting things to talk about. City Manager Barker is asking for approval of a letter to Ferrara Fire Apparatus for the purchase of a new fire truck. The letter seeks to place a “hold” on an in-stock truck until financing can be arranged. We are sure the truck costs something, but it is not in the letter or in the documentation within the agenda packet. The other interesting idea is that the City Council will look at participating in the PACE (Property Assessed Clean Energy) program. The program allows a property owner to apply for a loan through the PACE agency for improvements related to energy efficiency, hardening to weather, etc. The variable interest rate loan is then paid back to the PACE program through a non-ad valorem assessment to the tax bill for the property. The assessment stays with the property (not the individual) until it is paid off. That means people taking part in the program can leave the next owner of the property with the bill. Interestingly, any tax credits or rebates will go to the property owner but any carbon credits will go to PACE to help pay for costs. There are a couple of other odd things in the program as well. Aug 9, 2016 Posted by AAfterwit on Aug 9, 2016 | Comments Off on Satellite Beach: Hiding Losses And Spending Money. Satellite Beach: Hiding Losses And Spending Money. The opinion was issued on July 13, 2016, a week before the July 20, 2016 regular City Council meeting and 21 days before the August 3, 2016 Regular City Council meeting. At the August 3rd meeting, something a little strange happened. At the very end of her City Manager report, Courtney Barker brought up the issue of the decision and wanted to know whether the Council wanted to pursue an appeal of the case. Aug 7, 2016 Posted by AAfterwit on Aug 7, 2016 | Comments Off on Satellite Beach Loses To Goerschs On Fence Permit And Variance. 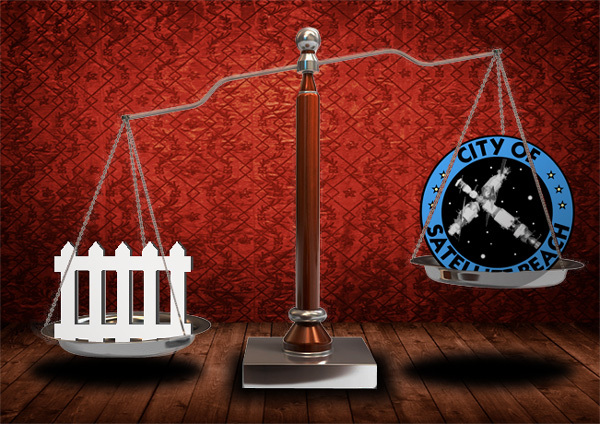 Satellite Beach Loses To Goerschs On Fence Permit And Variance. In case you missed it, Satellite Beach lost again in Court to the Goersch’s. Previously, the Goersch’s had beaten the City in court when the City tried to take back property that was vacated to the Goersch’s. The Goersch’s are said to be seeking reimbursement for their legal fees in the first case. We have no idea if they will seek the same lawyer fees in this second case. 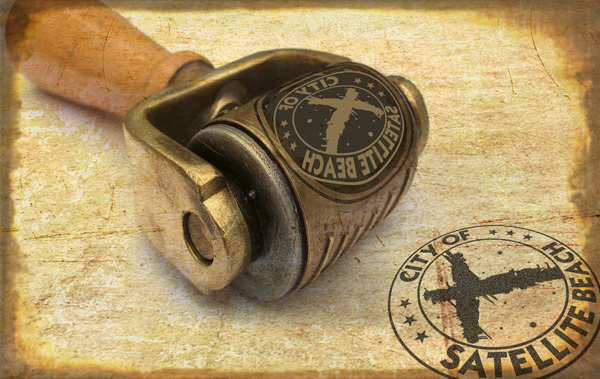 No matter what, it is impossible to say that the City has gotten anything but a black eye from this case. Whomever is telling the City to go forward with these suits seems to be giving questionable legal advice.